Taking money from the $1.7 billion highway between Puhoi and Wellsford and ploughing it into Auckland so that Magda can shop in Newmarket and then pop across to Britomart smacks of pandering to city dwellers when most New Zealanders don’t live in cities and need to drive to get anywhere. Oh dear the good old “it’s a loop and the trains will go around in circles” argument. This misunderstanding of the City Rail Link is the reason why calling it a loop is silly. Of course as anyone who’s spent more than half a second analysing the City Rail Link will understand, its biggest benefit is opening up the capacity of the whole rail system, allowing us to take cars and buses off the streets and significantly increasing the capacity of Auckland’s whole transport network. Secondly, what on earth is he talking about with the “most New Zealanders don’t live in cities”. One third of us live in a single city, Auckland. Add in the other main cities: Wellington, Christchurch, Hamilton, Dunedin and Tauranga and you’re probably looking at well over half the country’s population being within just these six cities. Owen McShane, director of the Centre for Resource Management Studies, said in the New Zealand Herald two years ago: “We are often told that Auckland has poor public transport use compared with cities such as Adelaide. But such arguments compare the Auckland region with the Adelaide metropolitan area. “We must compare apples with apples. Half Auckland’s region – including Rodney and Franklin districts – barely have roads, let alone buses. It’s a bit of a challenge to work out how the population of metropolitan Auckland compares to the population of the region as a whole. Wikipedia suggests an urban population of 1,354,900 and a metropolitan (assuming this means the whole area covered by Auckland Council) population of 1,462,000. So we’re looking at around 93% of Auckland’s population being within the urban part of the region – so really saying that half the area of Auckland has no public transport is somewhat irrelevant. In terms of our density (which Wikipedia suggests is 1,247 per square kilometre although Demographia suggest somewhere around 2,200) yes we are definitely no Hong Kong – but very few places are and that doesn’t mean they don’t have functioning rail systems. Perth, Sydney, Vancouver and Brisbane all have either very similar or actually lower densities than Auckland – yet all have very well performing rail systems. It’s blatantly obvious that rail is dead in the water. Billions and billions of dollars have been thrown at it over the years in this country and it’s still on he slippery slope to oblivion. 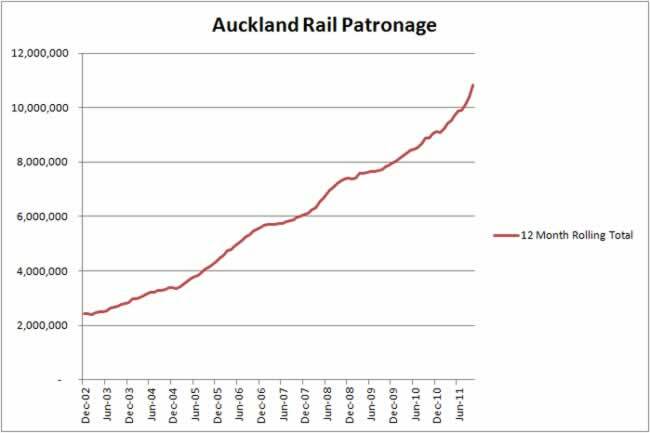 Just for interest’s sake, here’s a graph of rail patronage in Auckland over the past eight years: Not exactly what I would call “a slippery slope to oblivion”. When it comes to the London Underground, that system constantly runs at a loss and is used by the unions as a threat whenever they want more money. Shut that puppy down and London stops – I know, I’ve been there when there’s been a strike, and it’s chaos. So London’s Underground is pointless because it runs at a loss and is used by unions as a threat when they want more money, but – hang on- at the same time when the underground is shut down the entire city stops. So maybe it’s quite important after all? It has been reported that the Greens want a compact central city built on efficient transport, and cited Auckland Transport’s estimate that the CBD capacity for employees and residents could triple if the rail link were built. Are they mad? By adding a couple of hundred thousand rugby supporters to the Auckland mix at the start of the World Cup, the place ground to a halt and fans couldn’t use the rail system to even get to Eden Park. Of course the obvious point to make is that if we had the City Rail Link in place then the rail system would have vastly more capacity to deal with large crowds like we saw on Rugby World Cup opening night. I’m not quite sure whether the whole article is just a “wind up” – or whether the author is serious about what he’s saying. With so many blatant errors I must say I’m leaning towards the former. The comments are an interesting read though – an increasingly well educated public when it comes to transport matters seem to be generally winning through. This same author wrote a few months ago about how greens just don’t get it, the environment is doomed anyway and has been for years, so doing anything to help the environment is a waste of time. I think he’s trying for the Jeremy Clarkson market. Not true. Clarkson writes funny bull____, and I can’t find the funny in Thompson’s bull____. Not one attempt at humour, or if there was one, I missed it. There’s also the fact that Auckland is going to add another half-million people in the next 20 years. An idiot, on every count. It might be worth writing up a reply; it may get published. I want to know who let this be published. The statement about nzers not living in cities is an out right lie. I’m in Japan at the moment and what amazes me is how little traffic there is. If you didn’t know any better you would think that there were less cars than in NZ. Btw traveling by shinkansen is amazing. Like flying but more comfortable. Does anyone know if it was in the print edition today? Sure was, in the motoring section; he is a petrol-head ‘writer’…. That article is just rubbish. What’s the density of the CBD and of central Auckland? What is the Auckland Council planning it to be? Aside from the CBD rail link doubling capacity at Britomart, it provides new CBD stations enlarging the network, promoting development of the surrounding areas and reducing the proportion of trips may by road, i.e. peak hour congestion. How is something like that actually printed. What a waste of ink. Haha I read this article today, and actually thought the blogs would give analysing it a miss because its just so delusional and illinformed that its not even worth arguing against. Thankfully is seems only a small minority make any sense of this rubbish, if the comments thread are anything to go by. Its this kind of thing that I think AT needs to start tackling head on with clear, well reasoned arguments as to why its needed. The more they can dispel the myths the less likely crap like this will see the light of day. Eric Thompson is notorious for putting down people who do not drive — pedestrians, cyclists, PT users — on his weekly column. Polarising opinion writers sell papers and page impressions. Precisely, he’s trying to be the Michael Laws or Paul Henry of the motoring supplements. Lacks the wit to be a Clarkson clone. By saying most NZers “don’t live in cities”, I think he means “don’t live in a CBD”, which is what he thinks is the only area to benefit from the CRL. I know, it doesn’t change the piece being idiotic. He probably goes cruising in his Impala with Joyce on the weekends…..
Its labeling something to mock it. Sort of like “Holiday Highway”. “Holiday Highway” wouldn’t be so accurate if the road didn’t have surplus capacity on all but a handful of holiday days each year. Whereas the City Rail Link is not in any way designed or intended to have deal with some strange need to have trains running in circles around the CBD. I think that the user comments posted on that piece are very positive. If we contrast those to a similar article from the same time last year I think you would find a far greater number that sympathise with the writer’s views, however on the above article most are opposed (which is great!). Matt L, the area of the old Auckland City council area includes the gulf islands. A casual glance will show that Great Barrier alone covers more land that the urban area on the ithsmus. To get the real urbanised density you could at least halve the area. Unfortunately stats NZ don’t do urbanised area, just political boundaries, but the ARC used to have a figure for it on their website if you can track that down. Within Auckland the only old council that didn’t also include huge tracts of rural land was north shore city, so it’s ‘legal area’ population density is highest. I remember one politicial actually claiming that NSCC was already the most intensive city in the country so they should stop any further intensification! I have a post scheduled to go up in a couple of hours providing some clarity on the population density debate. My earlier conclusion that he is an utter fool. I’ll stick with that, but I really am going to have to add dickhead because of the tripe he wrote for today’s Herald. Why give oxygen to this guy? I got 57 about it but refused to acknowledge it. Trust me. He wants lots of page views to his column so he can keep proving he is so controversial he is worth keeping on. He wants us to react, click on his column and rant. I am disappointed you have been sucked in. I think it’s important to point out matters where he’s factually incorrect. You are keeping him in a job. You have been sucked in. He was a nobody. You give him credibility. Yes, very much a case of Don’t Feed the Troll. maybe he wants to be the kiwi Clarkson, but he’s not half as smart or funny. I actually think the way Clarkson talks about PT and green stuff, helps the cause. This guy only helps upping the Herald’s advertising revenue. I’m MP from Epsom, so a fair whack of the long, detailed comments are mine, but still quite a few others contributing. However, still disappointed at how many a) think it’s about rail in the CBD, and/or b) think that the SJMHH is essential to Northland’s economic future. My first comment is rapidly coming up on 200 likes. None of the anti comments is even coming close, as I don’t see any that have broken 100 yet. The only posts with three-figure like totals are pro-CRL. I saw the article on my tablet yesterday and didn’t even get past the first page of comments – case of Don’t Feed the Troll. However I did repost the article into my Facebook Link with my own comment: And I quote “Bloody Muppet, really is. Congrats your divisiveness has just sent a few more thousand votes to The Greens, rile up Auckland even more and undermines the work progressive people like myself are trying to in getting a balanced approach that will not blow the bank for Auckland’s Transport. I supposed I was riled up as Tuesday just gone I was giving my presentation to the Draft Auckland Plan Hearing Panel in which I mentioned Transport in particular length and my “ideas” behind it. Does Eric Thompson drive a Hummer by chance? PS. Anyone who wants to go both barrels on the McMansion & Hummer brigade, my “Holiday Highways to Nowhere” poster can be downloaded from my new blog. This is exhausting. Idiots like this will make stuff up to support their view and they don’t care if people want to set them straight on the facts. This man is a moron and really should be ignored. Wow, that certainly is an astounding piece. I love his belief that despite the restrictions on our freedoms we can still drive. Doesn’t he realise that a CRL would clear the roads of the Communist low emission lightbulb, low output showerhead users, freeing up more space for this freedom drive. I wonder if idiot-boy will start on unionists now that his idol has?